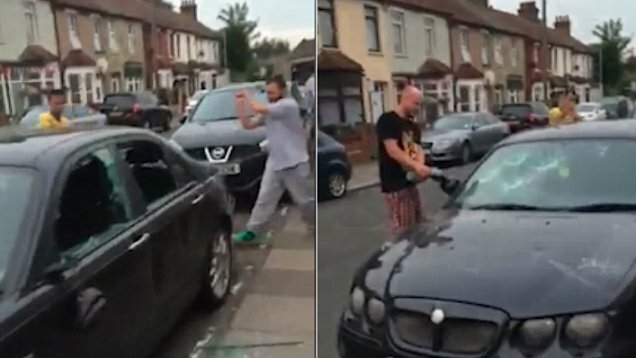 Shocking footage has emerged of a gang of men, apparently from Romania, destroying a car in broad daylight on the streets of Barking in London. Neighbours apparently fled with terror when the men appeared brandishing golf clubs, baseball bats and a pick axe! According to reports tension had been rising in the area due to the fact that one neighbour was apparently parking in what the Romanian gang perceived to be "their space." An anonymous source was quoted as saying: "A neighbour was parked on the parking lot. The car stayed there until the authorities arrived and put the clamp on the wheel until the owner replaced the road tax. That infuriated the Romanian's who vandalised the car. It was not the first time the car had parked there, the boys were in kind of a conflict." The Police have said that no crime has been reported to them and there does not appear to be any plans to take action against the gang. Do you agree we need to control our borders? Read: "Billionaire SAYS EU should regulate what you see on social media!" Read: "Ministers and other MP's are not Happy"